In Latest Twist, Anti-Doping Watchdog Says It Has Data Trove From Russian Lab : The Two-Way The World Anti-Doping Agency says the "enormous backup file" covers more than three years of testing data from the Moscow Laboratory. The database was reportedly provided by a whistleblower. 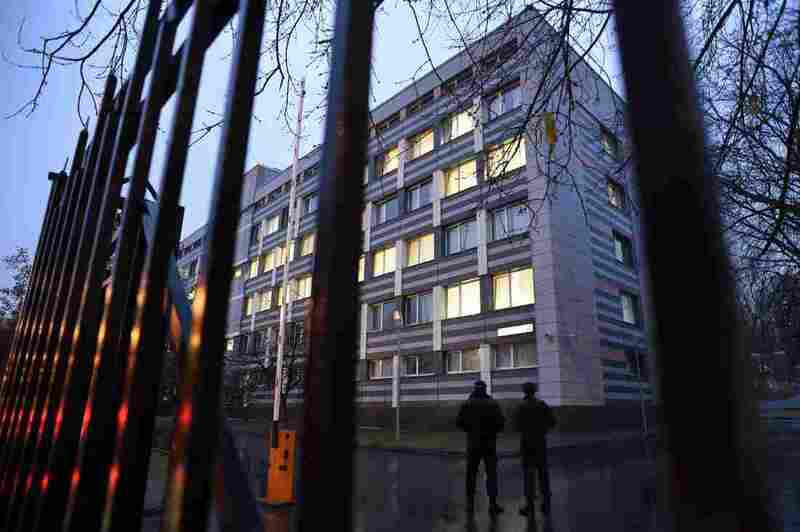 The World Anti-Doping Agency says it has acquired more than three years of testing data from the lab, in the building pictured here, which WADA says was the site of a state doping program of Russian athletes. In what may be the crucial missing piece in the investigation into the Russian state doping program, the World Anti-Doping Agency said it is in possession of the database of test results from Russia's anti-doping laboratory. WADA says the "enormous backup file" covers all the testing data from January 2012 to August 2015. That period includes the 2014 Sochi Olympics, at which Russia dominated the medal stands. The New York Times reports that according to two sources with direct knowledge, the electronic file was handed over by a whistleblower, not through official channels. Last summer, an independent WADA investigation by Canadian lawyer Richard McLaren confirmed widespread and institutionalized doping before, after and during the Sochi Olympic and Paralympic Games. WADA says the freshly acquired database, which Russian officials have refused to hand over, will allow the agency to cross-reference the McLaren findings. "In total violation of the WADA International Standard for Laboratories ("ISL") all analytical positives appearing on the first sample screen at the Moscow laboratory were reported up to the Deputy Minister after the athlete's name had been added to the information to be supplied. The order would come back from the Deputy Minister 'SAVE' or 'QUARANTINE'. If the order was a SAVE the laboratory personnel were required to report the sample negative in WADA's Anti-Doping Management System ('ADAMS'). Then the laboratory personnel would falsify the screen result in the Laboratory Information Management System ('LIMS') to show a negative laboratory result. The athlete benefited from the cover up determined and directed by the Deputy Minister of Sport and could continue to compete dirty." Over at the Times, you can see photos of the hole in the laboratory wall through which positive urine samples were swapped with clean ones. "The subterfuge included using table salt and Nescafé instant-coffee granules to help conceal tainted urine and bypass controls, according to the inquiry," the newspaper reported. "Some samples were clearly fraudulent: Urine provided by two female hockey players at the Sochi Games contained male DNA." WADA says it will finalizing its forensic analysis of the database before its board meetings next week. The new intelligence could have major implications for Russia's participation in the upcoming Winter Games in Pyeongchang, just three months away. The International Olympic Committee said it will decide next month what to do about Russia's participation in Pyeongchang. When the initial McLaren report was released in July 2016, it led to the banning of more than 100 Russian athletes from the Rio Olympics. Russia's Ministry of Sport did not immediately reply to NPR's request for comment, but Russian officials have been consistent in calling the doping charges politically motivated. "All of Russian sport finds itself under pressure, under political pressure," Russia Olympic Committee deputy director Igor Kazikov said on Friday, according to the Associated Press, adding that most IOC cases against Russia's athletes were "baseless and unsubstantiated." This month, the IOC banned six Russian cross-country skiers for life. In response, Reuters reports, Russia cross-country skiing federation president Elena Valbe said the move "has ... absolutely nothing to do with sport. ... For me, it's (political)." "without access to Russia's lab data and forensic analysis of it, the extent of similar discrepancies and the full scope of cheating could not possibly be known. "But if the database now in the regulator's possession reveals new inconsistencies in the testing histories of Russian athletes, sports officials could mount strong disciplinary cases. "Without a positive drug test, it can be challenging to build a case against an athlete that will withstand a legal challenge. To date, Olympics officials have issued sanctions against six Russian Olympians who competed in Sochi and exonerated another; investigations into scores of others are continuing." The anti-doping regulator declared the Russian Anti-Doping Agency noncompliant in November 2015. To be reinstated, the watchdog has asked for Moscow authorities to accept the findings of the McLaren report and provide access to the Russian lab's data and samples. "This new intelligence serves to reinforce our requirement of Russian authorities that they too publicly accept the outcomes; so that, we can all move forward in rebuilding public trust and confidence in Russian sport," WADA President Craig Reedie said today in a statement.